Welcome to the 2nd Annual Race to Cure Sarcoma Atlanta! The Sarcoma Foundation of America (SFA) invites you to join us for a family friendly walk/run event. Our goal is to raise awareness and financial resources for sarcoma research. By participating in this fundraiser, you'll share your story with others while raising much needed funds for sarcoma research. Your funds will support both the SFA's national research program. 3 Mile Family Fun Walk, or Run and then tons of fun! Stay after the race to celebrate with our sarcoma survivors, enjoy refreshments, meet some beautiful Disney princesses from Dream a Little Dream Entertainment, have a blast in some Xtreme Airballs, win some amazing items in our raffle and tons of other fun activities will be announced! 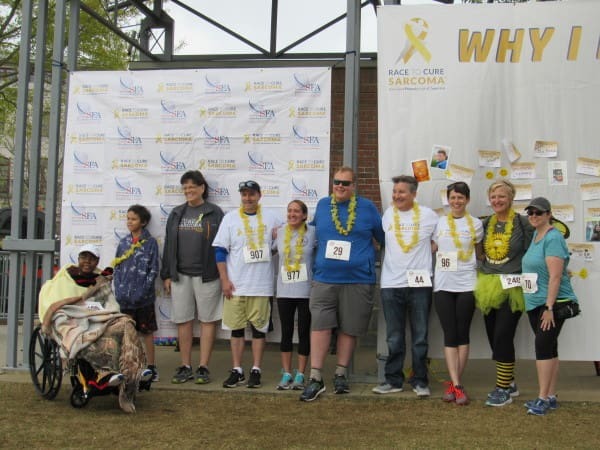 When you choose to take part in the Race to Cure Sarcoma Atlanta you are choosing to join hundreds of others who want to make a difference for sarcoma patients and their families. Join us and the sarcoma community and be a part of the premier run/walk series in the United States focused on raising awareness and research funds for sarcoma. Funds raised through RTCS Atlanta drives innovative sarcoma research nationally, through the Sarcoma Foundation of America.